Prophet Muhammad (sa) described the superiority of learned individuals over devout ones to be like the superiority of a full moon over the rest of the stars. He promised that those who set off on the path of knowledge will have their path to paradise made easy by Allah. (At-Tirmidhi and Abu Dawood; authentic) Each and every student can rejoice in this good news, and especially the student of the Quran, for no knowledge is more previous than that given in the Book of Allah! 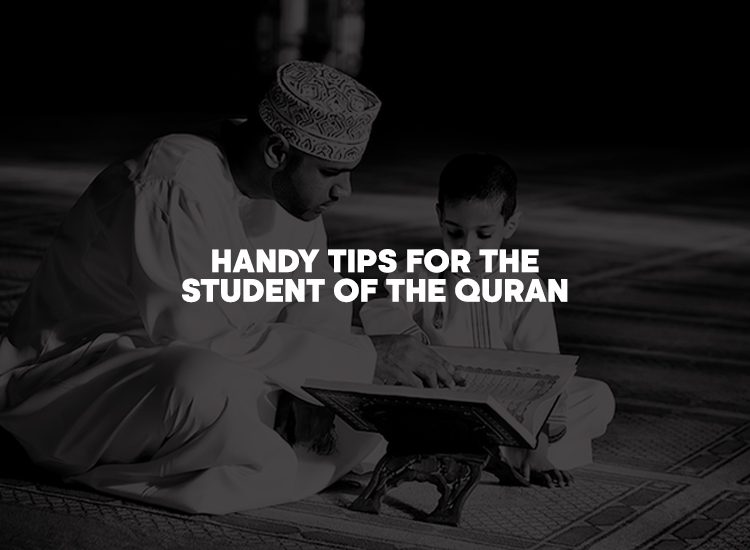 If you are a student of Quran or maybe you want to embark on the journey to create a better connection with the Book of Allah, the following handy tips can be adopted or adapted to help you along the way! Try and memorize a small part of the Quran, even if it is one Ayah every day. Choose Surahs or passages that have special significance such as the first and last ten ayahs of Surah Kahf, Surah Mulk, Surah Ikhlas, Falaq and Naas and so on. Recite from your memory everyday in your Salah! Find a translation of the Quran that you like and read a few ayah a day and contemplate on them. Maintain a notebook where you can note down something that has really struck a chord with you, or a part that confuses you so that you may question a learned scholar about it. Make vocabulary cards if you are learning Arabic or learning the word-to-word translation of the Quran. Go through these cards weekly so that you can secure your learning. Spend a few minutes daily to learn the new cards. You learn most when you truly listen. Listen to various recitation of Qaris, to explanations of the Surahs by different scholars and motivating lectures. There are many online websites and Smartphone applications that can help you in your journey. Sites like qutor.com are great places to find tutors to help you, or students whom you can help. There are many Quran and Hadith applications that can be downloaded on your phone to help you with your tasks as well.